November 21, 2008 | Santa Barbara, the American Riviera, is the venue of some o California's most exquisite landscape and interesting places to visit. The beaches alone are worth enjoying. The city of Santa Barbara is home to the Santa Barbara Zoo, Stern's Wharf, State Street, and the Mission Santa Barbara . All of these sites are worth dedicating an afternoon to explore and experience, but the Mission Santa Barbara, also called Queen of the Missions, remains in a league of its own. 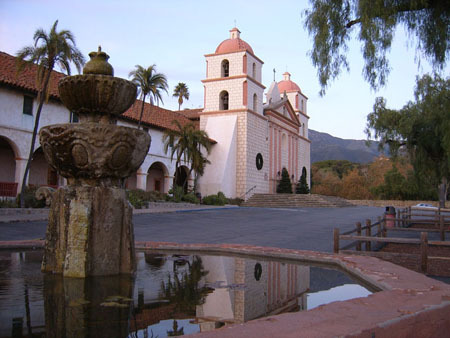 It is an incredible piece of history and remains a popular tourist spot in Santa Barbara. The Mission, which was founded on Dec. 4, 1786, is the oldest post Columbian structure in the area. The history is rich and mixes the stories of the colonial Spaniards and the local native people called the Chumash. The mission today still serves as an operational Catholic church that regularly holds Mass. The mission grounds also houses a homeless shelter and drug and alcohol facility. Although the mission has survived over 200 years it remains a constant prey to the hostile and volatile California wildfires. This year is no different than ones from the past. The week of November 9, saw wildfires devastate the town of Montecito which borders Santa Barbara and is within 10 miles of the Old Mission. Daniel Carrol, project technician, said, "The mission received no harm from the fire. The smoke and ash also was not an issue. The only glitch we saw was our power was shut off for two hours. The numbers of visitors to our homeless and drug and alcohol facilities remained steady." This historic landmark has fared another fire scare and has emerged virtually unaffected. if you ever visit the Santa Barbara area . In fact, if you are ever near the coast between San Diego and San Francisco you can be within a short distance of any of California's historic 21 Missions .